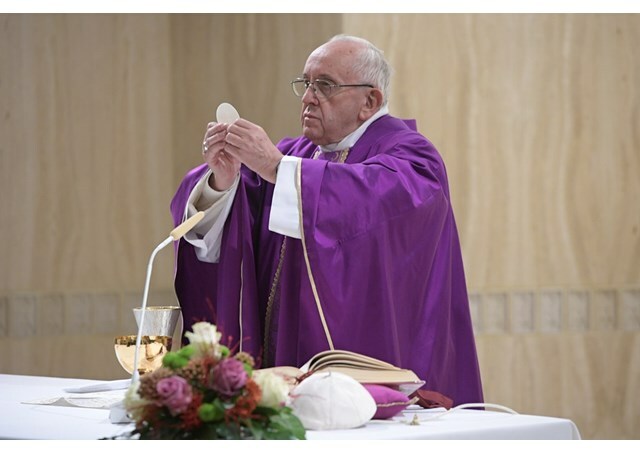 Pope Francis celebrated morning Mass at the Casa Santa Marta in the Vatican urging Christians to lead a fruitful life. Speaking during the homily at morning Mass in the Casa Santa Marta, the Pope invited those present to contemplate the empty cradle that is awaiting the Child and to make sure that are hearts so not stay closed like a museum specimen. Material and spiritual fruitfulness, the Pope explained, means giving life. He said a person may choose not to marry, like priests and consecrated persons, but must live by giving life to others. Woe to us, he continued, if we are not fruitful with good works. Fruitfulness, Francis continued, is a sign of God, and he recalled how the prophets chose beautiful symbols like the desert. “What is more sterile than a desert?” He said “and yet they say that even the desert will flourish, the dryness will be filled with water. This is God’s promise”. The devil, the Pope continued, wants infertility: “He does not want us to give life, be it physical or spiritual, to others”. “He who lives for himself produces selfishness, pride, vanity, greasing the soul without living for others. The devil is the one who grows the weeds of egoism and stops us from being fruitful” he said. The Pope said it is a grace to have children to close our eyes when we die, and he recalled the example of a ninety-year-old missionary in Patagonia who would say that his life had passed like a breath but that he had had so many spiritual children besides right up until his last illness. “Here is an empty cradle, we can look at it. It can be seen as a symbol of hope because the Child will come, or it can be seen as an object from a museum, empty of life. Our heart is like the cradle: is it empty? Or is it open to continuously receive and give life?” he said. I suggest, Francis concluded to look at this empty cradle and say: “Come, Lord, fill the cradle, fill my heart and help me to give life, to be fruitful”.